In this episode, we reach the end… for now… of the original Vampire: the Masquerade line. White Wolf brings their World of Darkness line to an end with the culmination of Time of Judgement storyline. This is one of four Time of Judgement books that ushers in the end of the World of Darkness. Those include, Apocalypse for Werewolf: The Apocalypse, Ascension for Mage: The Ascension and World of Darkness: Time of Judgment for the other game lines. This book was written by Bjørn T. Boe, Travis-Jason Feldstein, Christopher Kobar and Dean Shomshak and developed by Justin Achilli for White Wolf Publishing. It was released January 14th, 2004. Anyone interested in sharing their game with a wider audience, please send me info about your game, location, genre type and how people can track it down to: Nathan@utilitymuffinlabs.com Please make sure you are looking to recruit players AND you are on the staff of the game - Players, we know you love your home game, but tell your ST or game ORG to send us a shout-out! Psst. Did you know that we reward some of our Patreon backers with an online vampire game called, Curse of Caine? Written by: Authors: Bjørn T. Boe, Travis-Jason Feldstein, Christopher Kobar and Dean Shomshak. The prophecies of Gehenna were true. The world teeters on the brink of an undead apocalypse, the night when the progenitors of the vampire race rise to consume their childer amid a rain of blood and fire. As the fated Armageddon for the Kindred arises, what can they do? Drawing the Vampire Line to a close, Gehenna brings about the conclusion of Vampire's World of Darkness. Featuring a sliding scale which Storytellers can custom-tailor the events of The End to their own chronicles, this book places the final accounting for the curse of Caine in the hands of the players' characters. In this episode, Nate and Bob review the Penultimate VTM Revised edition book. The Red Sign tells the story of a conspiracy of vampires and mages seeking to reverse the curse of Caine. This book is a cross-over with Mage: the Ascension. The book is a part of the Time of Judgment and centers around the last conspiracies of both that formed towards the end of the world. This book was written by Brian Campbell, Conrad Hubbard, Jacob Klunder, and Carrie Lewis and released October 20th, 2003 and published by White Wolf Publishing Inc. Check out Andrew’s WW inspired creations! Click here to purchase from DriveThruRPG and help our show! The Curse of Caine is a Biblical punishment, handed down by God Himself. Could it be true that a conspiracy of Kindred and mages has found a way to reverse its effects? As the world comes closer and closer to Gehenna, might the Kindred escape their divine fate? Or is it all part of some larger plan? As a title that combines the themes of Mage and Vampire, The Red Sign is a Lovecraftian revelation of ages-old horror. As the Kindred discover a method to escape damnation, a faction of mages aids them in their blasphemous quest. Players can either join the conspiracy or oppose it -- or find themselves knowing entirely too much about it. In this episode, we discuss the Vampire Players Guide for the Revised edition of Vampire: the Masquerade. Unlike previous editions, this book is light on game mechanics and highly educational. This book was written by Kraig Blackwelder, Carl Bowen, Ann Braidwood, Jacqueline Brasfield, Christopher Gunning, Conrad Hubbard, Evan Jamieson, Jim Kiley, Christopher Kobar, Rhiannon Louve, Ari Marmell, Matt McFarland, Patrick O’Duffy, Chip Quinn, Aaron Rosenberg, Myranda Sarro, Dean Shomshak, Greg Stolze, Adam Tinworth and Janet Trautvetter with development and additional material by Justin Achilli. the Vampire Players Guide was published October 6th, 2003 for White Wolf Publishing. Follow Bob and Nate as they take a journey into the mysterious lair of the Inconnu and explore Hunedoara Castle in 2003's Lair of the Hidden. This book acts as sourcebook and chronicle/module for Vampire: the Masquerade's Time of Judgement. The Time of Judgment series is semi-canon and is intended to allow players the option to end their own personal stories. Unlike previous themed years, there were no events characterizing the Time of Judgment that affected all World of Darkness game lines; instead, each game was given a selection of its own specifically-tailored final fates or multiple endings which are determined by the actions and choices of the player. Lair of the Hidden was Written by: Sarah Roark, Dean Shomshak, and Janet Trautvetter and released August 11th 2003 by White Wolf Game Studios. If you're in the Indianapolis area, check out Indianapolis by Night for V5 action! Help our podcast by purchasing this book with the link above via DriveThruRPG! Hidden from time and prying mortal eyes, Hunedoara Castle lurks amid the mists of the Carpathians. Home to a cabal of scheming Inconnu, the castle is the site of hideous rites. Who do these terrible rituals empower? Or, worse, who might they protect? Secrets revealed -- Lair of the Hidden is a setting sourcebook and chronicle that examines the plans of a forgotten cult of Inconnu. It covers the cults aims and goals, as well as presenting a terrifying haven of powerful elders for players characters to explore -- should they dare. This week, Nate and Bob take a dive into what is considered by some to be the definitive guide to Paths of Enlightenment. This revised books is the first to collect "all" the current Paths into one, simple guide. From the standard paths, all the way to the obscure and heretical paths, Chaining the Beast puts the sum of vampiric morality in the palm of your hands. 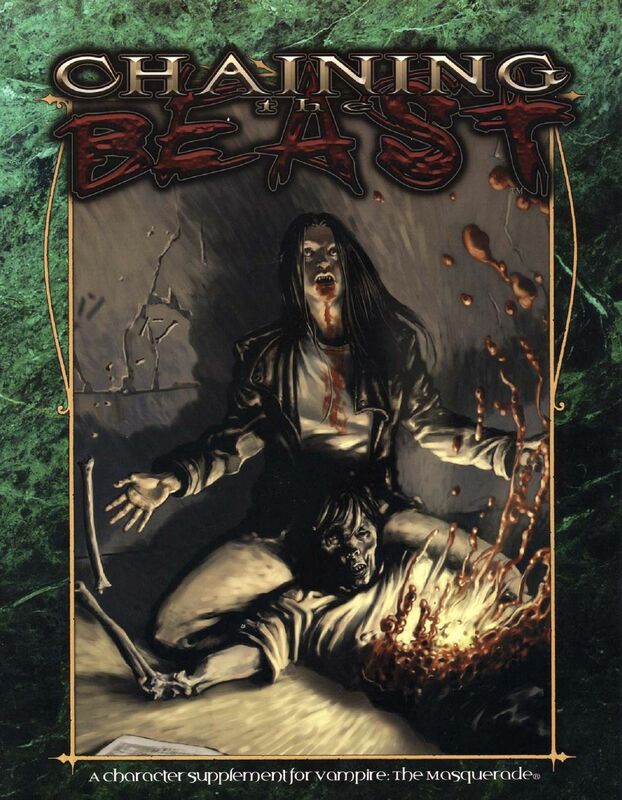 Chaining the Beast was written by Gavin Bennett, Trevor Chase and James Kiley and released June 30th, 2003 for White Wolf studios. Does a Vampire Have a Soul? Not all Kindred follow the sacred Path of Humanity. Some forsake their mortal ethics, giving themselves wholly over to the vampire condition. Others abandon the moral struggle altogether – and find themselves in the throes of Frenzy. How can the race of Caine steel itself against its murderous impulses? By popular demand, Chaining the Beast explores the Paths of Enlightenment in detail, from the Hierarchies of Sin to the myriad nightly concerns of a vampire who upholds them. A resource for those seeking to explore the alien mindset of the undead, this book sheds light on the dark corners of the Kindred psyche. In this episode, the fellas get back to work, bringing you brand new reviews of old books. This week, we review the oft-forgotten sleeper, "Succubus Club: Dead Man's Party," from 2003. This books gives kindred and cainites alike the skinny on how and why to throw an event. More than just a party, the social event is the crux of unlife in modern society. Additionally, this book explores the popup nightclub known as the "Succubus Club." The Damned are solitary monsters, contriving elaborate social situations for themselves to deny the prominence of the Beast. Parties and other social affairs from graceful soirees to brutal Sabbat ritae are the foundation of undead reputation. Hosting such affairs, whether as a pack priest or as a nascent prince, can be as arduous a process as claiming a domain. For players looking to enhance their characters status or reputation, Succubus Club: Dead Mans Party is an invaluable resource. Covering all the stages of planning a social affair from concept to implementation (and aftermath), this title is invaluable for players who want to participate in the grandiose social structure of the undead. This book contains information useful to Kindred of all clans, sects, ages and generations. 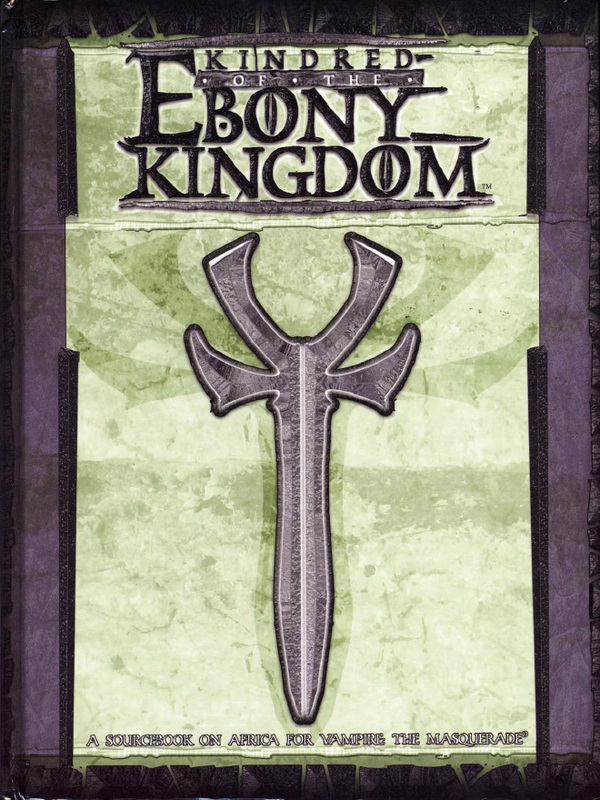 In this episode, Nate and Bob discuss part two of the Kindred of the Ebony Kingdom Sourcebook. This sourcebook details the culture and society of the Laibon; the kindred of the African continent. We talk a little bit about or upcoming plans to review V5, the new edition of Vampire: the Masquerade, coming in August. Also, make sure you get your ticket for our meet up event at Gen Con! Link below!!! This book was written by Justin Achilli, Jason Feldstein, Joddie Gray, Will Hindmarch, Ari Marmell, and Voronica Whitney-Robinson for White Wolf Publishing and released April 28th of 2003. We will be hosting a meet-up at Ten Con on Thursday, August 2nd! Click below to reserve your spot because space is limited! Click here to buy this book via DriveThruRPG, again, and support our show! Africa has long been a bastion of mystery in the World of Darkness. Finally, the domains south of the Sahara are revealed - and the laws of Western Kindred hold no water here. Out of the Kingdom of the secretive Laibon come the monstrous Guruhi,the atavistic Naglopers and the wise Akunanse - and untold other horrors. Created in the tradition of Kindred of the East, Kindred of the Ebony Kingdom offers an all-new take on the race of Caine. Although presumably still descended from the FirstVampire, the Kindred of Africa have evolved a very different society - one completely alien to Western Kindred. Many mysteries of the Cainite race play out here in the Ebony Kingdom, and just as many rise to take their place. In this episode, Nate and Bob discuss the Kindred of the Ebony Kingdom Sourcebook. This sourcebook details the culture and society of the Laibon; the kindred of the African continent. Also, this review will be split into two parts. In this first episode, we whet our whistle for the Laibon, as well as 'soapbox' for a large portion of the podcast. Next episode, we will dig deeper into the culture, character creation, disciplines and more of the book. Click here to purchase this book from DriveThruRPG and help our show! 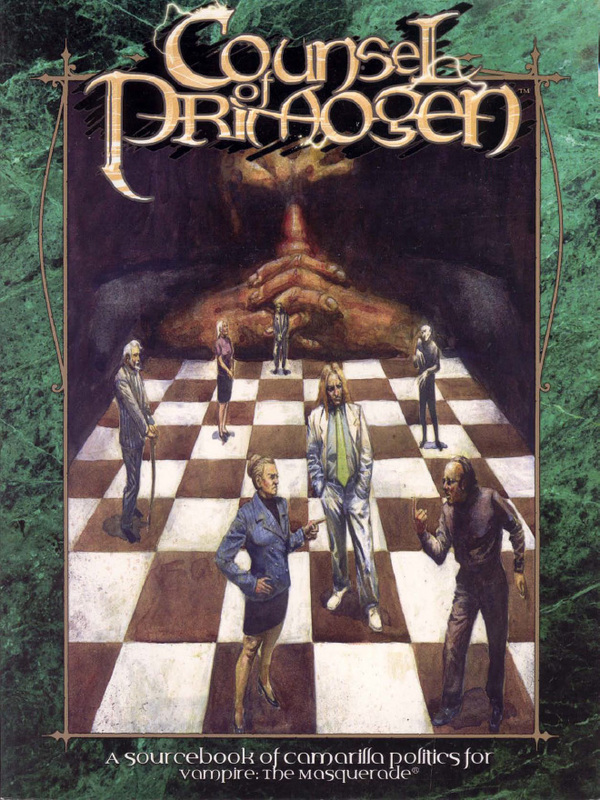 In this episode, Nate and Bob review the 2003 Camarilla Sourcebook, “Counsel of Primogen.” This book takes a deep look at the grand, powerful and often misunderstood coterie of elders. This book focuses on both playing them as characters and using them as allies and antagonists. This book was written by Kraig Blackwelder, Christopher Gunning, Ari Marmell and Cynthia Summers and developed by Justin Achilli for White Wolf Studios on March 3rd, 2003. Scions of the Great Clans All Kindred froom neonates to elders accept the primogen as the voices of their clans in a prince's domain. What truly falls under those auspices, however, varies from city to city. From councils of primogen that pull a puppet prince's strings to the coteries of primogen that exist at a prince's whim, the only constant in a primogen's unlife is that politics align against her. In this episode, Nate and Bob review the sourcebook for the Sabbat Sub-sect, the Black Hand. Gone are the days of the "True Hand," and all shits given have left with them. Today, we look at a mysterious group of mystical assassins who await the rapidly approaching Ghenna to take their place besides Caine. 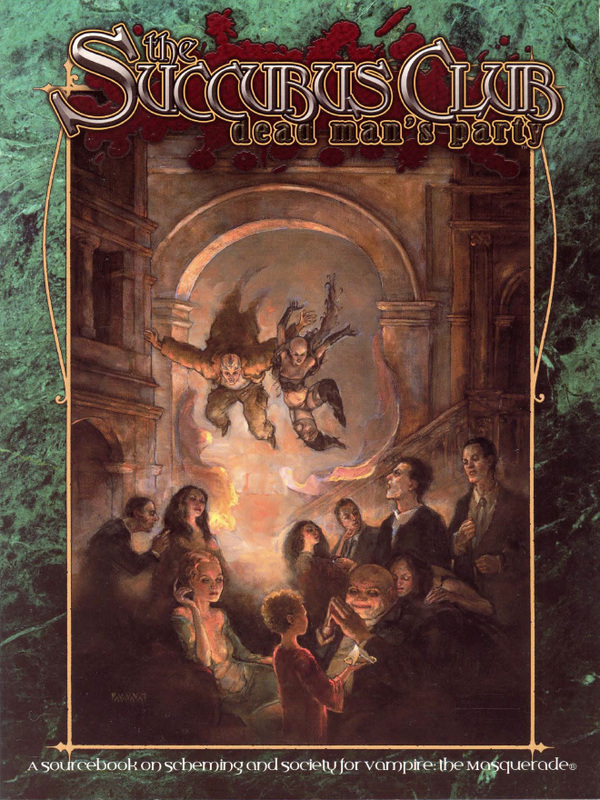 Like many other Vampire: the Masquerade books, Caine's Chosen is presented from many different sources and perspectives. This allows the book to have a healthy dose of subjectivity and complexity. This book was written by Sarah Roark, C. A. Suleiman and Janet Trautvetter, developed by Justin Achilli for White Wolf studios and released January 20th, 2003. Hidden behind veils of secrecy and mystery, the Black Hand serves as the martial arm of the Sabbat. When the blood and fire of the sect's packs and prisci fail to win the night, the Black Hand arrives like a grim cavity on the cusp of the night. With all its autonomy and authority, however, the Black Hand has turned upon itself - does it truly serve the Sabbat or has it become a Gehenna cult? World of Darkness: Mafia, Kindred of the East - Heresies of the Way, Werewolf: The Apocalypse - Possessed, Hunter: The Reckoning - Fall From Grace, Dark Ages: Inquisitor Rulebook, and Demon: The Fallen Rulebook. This book is a sourcebook for religion among the kindred of the World of Darkness. It was released November 25, 2002 and was written by Richard Dansky, Jason Feldstein, Ari Marmell and C. A. Suleiman and developed by Justin Achilli for White Wolf studios. Faith in the Final Nights sometimes tends to polarize people, and the Kindred are no exception. Despite the cynical lack of faith that all too often characterizes the modern nights, a rare few find strength in reverence of a higher power. For these Kindred, spirituality is often a harrowing road as they are forced to reconcile their undead natures with the tenets of a God they may well feel has abandoned them. Portraying a character who held his faith close to his unbeating heart has always been a challenge. This book looks closely at those Kindred, determining how they exist in the face of their obvious damnation. State of Grace applies real-world faiths to the World of Darkness, making for a realistic point of character development. 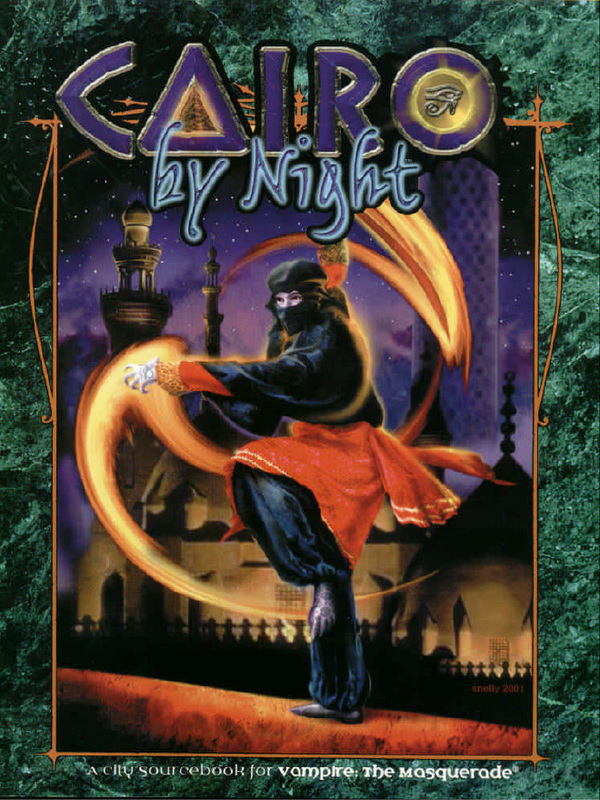 Cairo by Night was written by C.A. Suleiman with project consultation from Khaldoun Khelil. It was developed by Justin Achilli and published February 11th, 2002 for White Wolf Game Studios. Click here to purchase this book and help the show! Older than both of the warring sects combined, Cairo sits perched atop the Nile like a pharaoh upon a throne, but all is not well in the city. Ancient conspiracies play out nightly while the Caitiff prince struggles with the resident Kindreds issues of faith. Cairo hides a myriad of secrets from itself as well as its shadowy denizens. Cairo by Night presents a chronicle setting that focuses on two of Vampires core themes, the Final Nights and the price of eternal unlife. Suitable for characters of any power level, the events of this book will satisfy lovers of epic tales and personal horrors and everything in between. Cairo explores not only the Kindred that players expect to meet, but the others with whom they share the night. In this episode of 25 Years of Vampire: the Masquerade, we take about the in-game (and excellent OOC resource) prop, Encyclopaedia Vampirica. This book was "written" by a number of kindred luminaries from the World of Darkness. As such, there is no further info about the real-world authors. Psst. Did you know that we reward some of our Patreon backers with an online vampire game called, Curse of Caine? It's ONE YEAR OLD TODAY!!! Click here to purchase this book and help our show! Aisling Sturbridge, Regenta Prima of the Chantry of the Five Boroughs. For centuries, the Kindred have hidden from the wary eyes of mortals. Enigmatic creatures, the Kindred's efforts to uphold the Masquerade have often succeeded even beyond their own desires, and a few of the damned in the modern nights even know those outside their immediate domains. But the long and terrible history of the undead is as broad and sweeping as the myriad Kindred who make it. In this episode, we don't skimp on the reviews just because this is our second episode of the day. We review, "Havens of the Damned." I mean, what else can we say here? Just listen to the podcast, Jack! Psst. Did you know that we reward some of our Patreon backers with an online vampire game called, Curse of Caine? Even if you don't want to play (which deeply saddens me), there are links to the server so you can hang out, read some V:tM role-play, and make new friends! Almost every Kindred has a haven, and those who dont are a sorry lot indeed. From a princes sprawling estate to the steam-tunnel nest of a Nosferatu, havens say much about their owners. This collection of unique havens looks at the specific needs of the Kindred who maintain them and gives advice for how to incorporate them into a story. The purpose of Havens of the Damned is to encourage players and Storytellers to view havens as something more than simply where the Kindred rest during the daylight hours. A folio of interesting havens, this book introduces the perfect way to introduce new story hooks to any chronicle. In this episode, we talk about one of the better White Wolf revised edition books, Archons and Templars. Archons & Templars is a sourcebook for the martial arm of the Camarilla and Sabbat. It includes details on the history and formation of both roles, as well as character creation and storytelling information. Archons and Templars was written by Ari Marmell, Sarah Roark and Janet Trautvetter and developed by Justin Achilli for White Wolf Publishing and released April 15th, 2002. Click here to purchase this book from DriveThruRPG and help the show! Titles among the Damned arent always primogen or prisci. Somebody has to do the dirty work. From fighting Lupines to hunting rogue Cainites, from enforcing the Traditions to leading a crusade, a few bold vampires step forward to the head of the charge. Those vampires are the unsung champions of the night. The latest in a series of focused chronicle rules, Archons & Templars allows players to assume the roles of prestigious Cainites in the Great Jyhad. With the authority of their sects behind them, archons and templars are assigned the most dangerous duties and enforce the will of their leaders. Whether Camarilla or Sabbat, these chosen few take the fight to the front lines. In this episode, we talk about the 2002 release, "Guide to the Anarchs." This book details the history, practices and methods of the Anarch Movement up to the Revised Edition of the game. Learn about the rise and fall of the movement, as well as how the sub-sect has responded to the fall of the Anarch Free States. 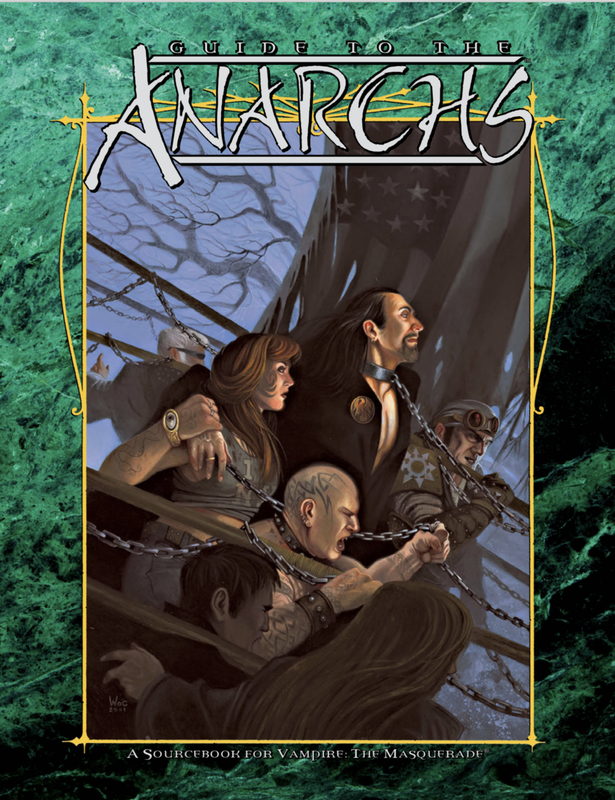 The Guide to the Anarchs was Written by: Justin Achilli, Carl Bowen, Noah Dudley, John Goff, Geoffrey Grabowski, Michael Mearls and Astrid Mosler and published March 18th, 2002 by White Wolf Publishing for the Classic World of Darkness setting and Vampire: the Masquerade. Click here to purchase this book via DriveThruRPG and help the show! Kindred society is stagnant, and it favors the priveledged. Elders claim domain over rights that, by their nature, belong to all of Caine's childer. Princes and archbishops alike abuse the very social contract that gives them the power they wield. What's the answer? Open revolution. Bring down the system! In this episode, we save the best for last, maybe? I guess than depends on your opinion about the Lasombra clan. Anyways, we find it enjoyable and hope to impart some of that upon you! This book delves into the clan's relationship with the Sabbat, the supernatural command of the Abyss, and Lasombra's roots in the Mediterranean and connection with the sea. 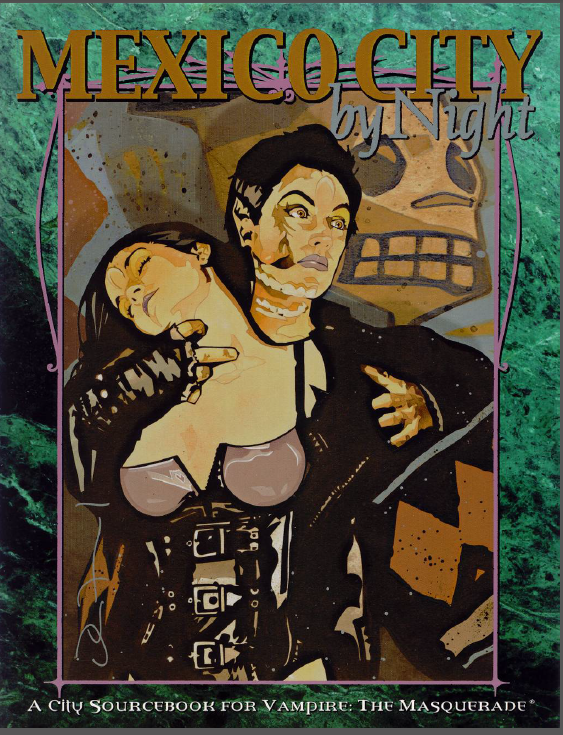 This book was written by Bruce Baugh with development by Justin Achilli and released December 26th, 2001 for White Wolf Publishing. Notice! We will be taking a break until May 4th, 2018 while Nathan moves to his new location! Thanks for your patience, and we'll be back with you in two weeks! The Final Nights have twisted the nobility of the Keepers clan, turning them into the aristocrats of that diabolical sect. Their legacy of shadows eclipses the light thrown by their packs ritual fires. But are the Lasombra truly the esteemed leaders of the Sword of Caine or do they simply abuse it to serve their own ends? As the next entry in the revised lineup of clanbooks, Lasombra takes one of the classic Vampire sourcebooks and brings it into a modern context. All-new information accompanies revised material, inviting you to add as much depth to your character as you like. In this episode, we discuss the city sourcebook for the capital of Sabbat, Mexico City. Known as "Black Babylon," this book is a must-have for any storyteller looking to take their players into the depths of the Sabbat. It was written by Written By: Philippe R. Boulle, Dean Shomshack and Lucien Soulban on August 5th, 2002 for White Wolf Studios. We will be taking a short vacation the weekend of April 27th - 29th. We will not be publishing any podcasts that week. Enjoy Spring Break! The city teems with over 20 million mortals. Since the dawn of the New World, Mexico ity has been the bastion of the Sword of Caine. In the modern nights it remains that way, though plagued by Cainite overpopulation and sundered from within by internal dissent. Although it presents a bold faceade, how strong is the Sabbat's sprawling home? In this episode, we discuss the city sourcebook, New York by Night. This book details the ongoing war between the Camarilla and the Sabbat for New York City. Click here to purchase the book from DriveThruRPG and help our show! In the wake of the Sabbat's aggressive campaign along the East Coast of the United States, the sect has spread itself too thin. The clever Camarilla took advantage of the Black Hand's disorganization and reclaimed New York City as its own. But with established princes and entrenched elders claiming domains elsewhere, to which Kindred will this new prize fall? In this episode, we discuss the concepts even the Kindred and Cainites find profane. Sins of the Blood is a sourcebook chronicling the so-called "heresies" of kindred society. From diablerie to Golconda, this book discusses the concepts even ancient vampires find heretical. This book was Written by, Angel McCoy, Matthew McFarland, Joshua Mosqueira-Asheim, Aaron Rosenberg and Lucien Soulban, with development by Justin Achilli and released Aug. 20th, 2001. The rules of the Kindred are many, varied and Byzantine. No two princes interpret the Traditions alike; one bishops treason may be anothers valor. Still, even in such precarious societies, heresies arise and sometimes flourish. From foul diablerie to inhuman codes of morality, some Kindred shock the sensibilities of their fellows. Sins of the Blood explores the crimes of the Kindred in the many forms they take. Blood cults, ideological heresies, autarkis and all manner of rogues populate the pages of this book, suitable as antagonists for coteries or as inspirations for players characters.